The Driver IRQL_NOT_LESS_OR_EQUAL Windows 10 is a blue screen of death (BSOD) STOP code error that may happen randomly, on startup, or other occasions depending on the situation. It basically means that there is a problem with either your drivers or the hardware itself which causes the STOP error to appear. The Driver_IRQL_NOT_LESS_OR_EQUAL Windows 10 STOP code may sometimes include a driver file such as tcpip.sys, netio.sys, syntp.sys, ipeaklwf.sys, iastora.sys, dxgmms2.sys, netwtw04.sys, wdf01000.sys or storport.sys. When a driver is invalid, incorrectly installed, corrupted or missing, Windows 10 will run into the blue screen Driver IRQL_NOT_LESS_OR_EQUAL STOP error when the driver is in use at any point of time. Aside from driver, it could also be the hardware itself which is failing and causes the driver to also fail to correspond to your request. Thus, causing the blue screen error. When the driver IRQL_NOT_LESS_OR_EQUAL Windows 10 blue screen error appears, Windows will create a crash dump file in the dump file directory – usually in C:\WINDOWS\Minidump\. This dump file will have the information of what and which driver or hardware is causing the error. Though if you can read the dump file, it’s a great way to quickly identify the problem hardware or driver. Normally for people who are not so computer-literate, reading and understanding a dump file is a difficult and near to impossible task. In that case, you will have to troubleshoot the driver IRQL_NOT_LESS_OR_EQUAL Windows 10 error by using trial and error to find the solution that works for you. There is no way to tell in exact what causes the driver IRQL_NOT_LESS_OR_EQUAL Windows 10 BSOD to happen apart from reading the dump file. The first thing to do is to try to recall any recent action prior to the error that may possibly cause the issue, and then try to revert them. For example, if you have recently installed any software that may interfere with your drivers, try to remove them and see if the blue screen will still appear. If you have recently installed a new hardware, replace it with the old one or a spare one if you have it and see if it fixes the problem. One of the most common reasons for a driver or a hardware to fail is you have overclocked one of your hardware and the hardware cannot sustain the clock value and the voltage input set by your overclock software. 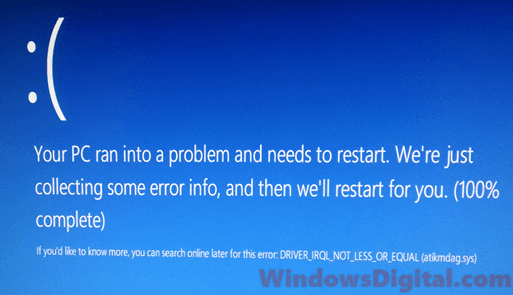 As a result, Windows returns the driver IRQL_NOT_LESS_OR_EQUAL Windows 10 blue screen error. Overclocking can be a dangerous act if you’re not doing it correctly. It means to force your hardware to run higher and faster than what it should be running by forcing extra voltage to it. Overclocking requires good cooling system for your hardware and adequate knowledge about overclock to begin with. If you have recently overclocked your hardware, disable the overclock settings and uninstall the overclock software. If you were overclocking through BIOS, set the clock value back to its default and see if it solves the problem. If the driver IRQL_NOT_LESS_OR_EQUAL Windows 10 blue screen error only happen when you play certain games, it can also imply that your hardware, especially graphic card and RAM, is overheated during the game. Hardware overheat can be caused by incorrect clock value set or when the hardware is starting to fail. Try to also clear the dust and dirt clogged in the cooling fan of your graphic card and processor. It can help reduce the temperature tremendously. Since the error directly relates to drivers, you may want to try updating all your hardware’s drivers to make sure they have the correct and up-to-date drivers installed. Drivers may sometimes get overwritten when a software forcefully install a driver in your Windows 10 without your consent. If that’s the case, updating the driver will help to correct the driver again. To update your drivers, run Windows Update. One of the most important task Windows Update would perform every time it runs is to automatically check your computers to see if any of your hardware need a driver update. Then, it will automatically download the latest matched drivers from Microsoft driver repository and install it on your Windows 10 PC. 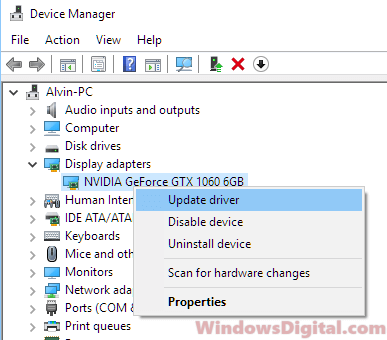 To update drivers manually, you can either download the latest drivers from the hardware manufacturers’ websites or use Device Manager in Windows 10. It’s recommended that you do this in safe mode, read – how to enter safe mode in Windows 10. Search for Device Manager, and then open it. Select and right-click the device you want to update. 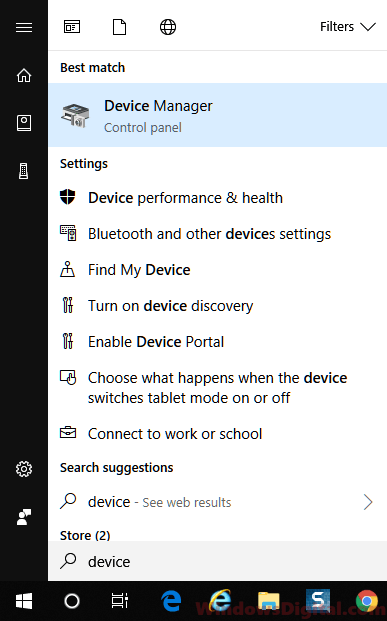 Select “Search automatically for updated driver software” to allow Windows to automatically search for latest driver for that particular hardware. 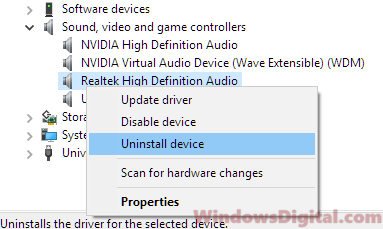 Optionally, you can select Uninstall driver for a device to uninstall its driver. Then, when you restart your PC, Windows will automatically search for and install the correct driver for your device. However, this method only works for common devices. If you have an exotic device, like a sound card no one has ever heard of, do not uninstall it if you don’t have the driver CD with you. If you have no idea what driver and which hardware could be the cause of the driver IRQL_NOT_LESS_OR_EQUAL Windows 10 blue screen problem, try to just reinstall the audio, network and graphic drivers. These devices are usually the most common causes for blue screen error and have the highest chance to fail. Write down your device’s manufacturer brand and the device’s model. Then, search for its driver on Google or go directly to the manufacturer’s website to look for latest driver download. Reinstall the drivers for all these three devices – audio, network and graphic card. 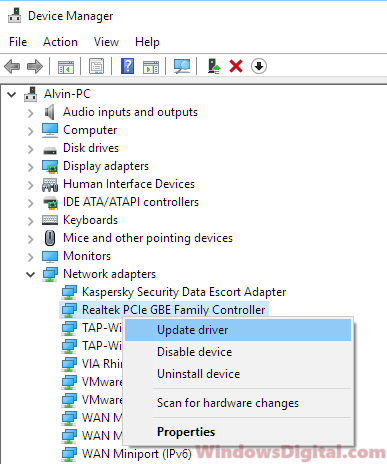 Alternatively, you can use the above method to update driver in the device manager. When nothing works to solve the issue, you can try to roll back your Windows 10 to a previous date. Read – how to roll back Windows 10 and how to system restore Windows 10 to a previous date. If your system doesn’t have a restore point, you may want to reset Windows 10 to factory default. Don’t worry, the Windows 10 reset process will allow you to keep your files while resetting. When all else fails, it’s highly possible that one of your hardware has failed or is starting to fail. You may want to replace the problem hardware to permanently get rid of the driver IRQL_NOT_LESS_OR_EQUAL Windows 10 issue. Description for sharing: Keep getting the Driver IRQL_NOT_LESS_OR_EQUAL Windows 10 blue screen STOP error randomly during a game or on startup? Here's how to fix it.